From the creator of the bestselling Linestrider Tarot (9780738748290) comes a world that is both strange and familiar - both other and kin. Each card in this unique deck features a being who inhabits the liminal space between myth and fact, human and animal. A lion with the body of a man sits on the Emperor's throne, a sagacious owl acts as Hierophant, and frogs and foxes take on human garb. Tarot's deep symbolism is brought into new light with these fanciful illustrations, created with hand-ground natural pigments on unbleached, handmade paper. 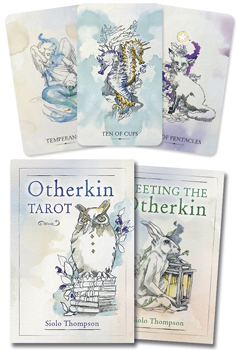 Based on the Rider-Waite-Smith system, Otherkin Tarot is suitable for both beginners and experienced readers. This is a deck that wants to travel and be left out in the moonlight; it's a deck that will improve with every use.